Researchers at the Lawrence Livermore National Laboratory (LLNL) are using a Dolomite Fluidic Factory to help develop a novel carbon capture technology intended for industrial applications1. "We use microfluidics to manufacture the microcapsules, and initially used custom glass microfluidic chips from Dolomite for this application. However, because we are a research lab, we are constantly tweaking and updating our designs, and manufacturing glass prototypes by hand is both laborious and complex; it’s as much art as science. 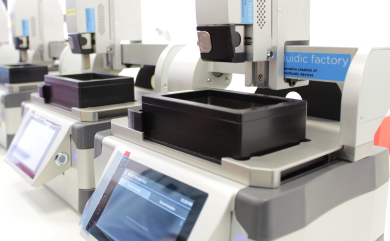 We wanted a 3D printer to allow rapid prototyping of new microfluidic devices, and our local Dolomite representative told us about the Fluidic Factory. We were immediately interested, and became a beta tester for the system."